In India, we have a wide variety of saree from casual wear to party wear and even for wedding ceremony. 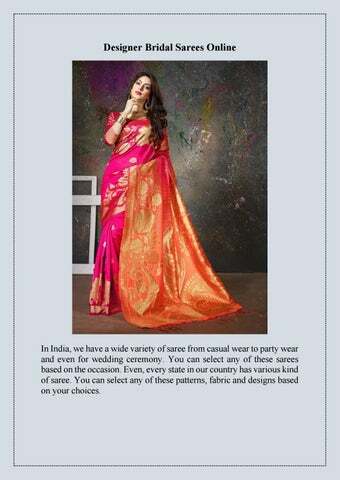 You can select any of these sarees based on the occasion. Even, every state in our country has various kind of saree. You can select any of these patterns, fabric and designs based on your choices. Net and fancy sarees are famous in North India, where as pure silk and kanjeevaram sarees very famous among East Indian and South Indian brides.There are many traditional and contemporary sarees which are elegant, gorgeous and just perfect for a bride. Make your choice from the most popular traditional sarees of India to get that desired look. Here, we are sharing the six most stunning traditional wedding sarees online. Kanjivaram Silk saree is a must have for all South Indian brides. Owning a Kanjivaram saree for any Sounth Indian bride is a matter of pride. kanjivaram saree is originated in Tamil Nadu, but very popular across the South India. kanjivaram saree is made of pure silk. It is very famous for its finest border work and fine detailing. You can buy a Kanjivaram in almost every color. This is very much Bollywood style saree and famous in North Indian brides. You can easily see many North Indian brides in fancy net sarees. These are very fashionable sarees. North-Indian brides select this net saree with fine embroidery work with bling on it. Net saree is available in almost every color and shades. Net saree is very comfortable as you can manage it easily. Banarasi Silk Saree is very famous in Uttar Pradesh as it belongs to holy city Kashi. The work and look of the saree can never be compared with any another saree. As every deign is unique and mostly woven by hands. The glow of banarasi silk saree is unmatched and just perfect for your wedding day. Patola is very vibrant and colorful saree as you can guess from its name. It is found its name from the small place of Gujarat state Patan. Patola sarees are rich with colors and looks very vibrant. These sarees have very bright color combinations with strong patterns and designs, which easily grab attention. This saree is a perfect pick for a family function and festivals. Pattu sarees are the proud abstract of Kerela and platter of its traditional colours. Keralites believe in nature and natural element more than superficial ones and thus they say that nature has so many colours in itself that you don't required to put any bright colours on your attire. 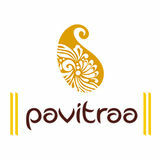 Pattu sarees are typically white sarees with extraordinary broader gold borders. Gota sarees are known for their broad intricate borders. Basically, a special kind of lace border is attached to the edges of the saree for bright striking appeal. These sarees are vehemently used by fashion designers as a part of their phenomenal fashion shows. Contemporary women love to adorn gota sarees for their special event to hold a gaze. Check out these ravishing sarees online and make them a part of your beautiful brand. Shine up girl!! !